Immaculately appointed & remodeled home in the hills of Carefree! This exquisitely redesigned home is not to be missed! From the moment you enter through the private gate on the property, you are greeted with the quality & care of this property. 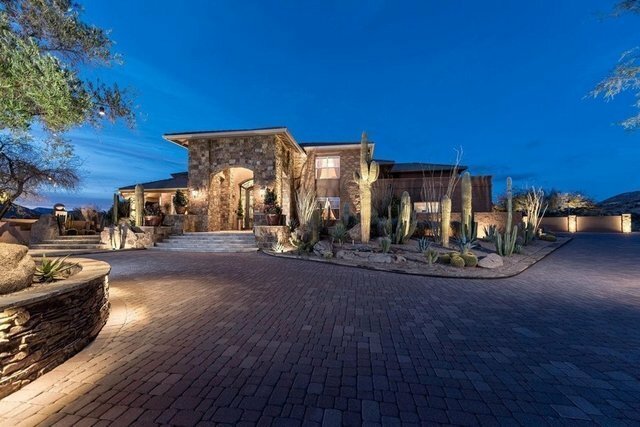 Pavered driveway, mature desert landscaping, custom ground lighting, sitting areas to capture the mountain & sunset views & more! Formal living room features fireplace & vaulted ceilings; formal dining room features blown glass chandelier & built-in cabinetry; family room features built-in entertainment center; wetbar & butler's pantry located off the kitchen; gourmet kitchen w/DCS stainless steel appliances; office w/fireplace, wood floors & bath. Separate 2000sf (approx) art studio w/private driveway could be used as auto garage. The entertainer's backyard features large ramada for outdoor dining, Pebble Tec pool & spa, both with rock waterfalls, built-in BBQ w/island, outdoor fireplace & sitting area. Four-car garage w/epoxy floors & built-in cabinetry. Large 4-car garage, built-in cabinetry & more This is a gem in the desert & not to be missed!